When you create pricing plans for certain categories, it will not be possible to submit listings without ordering and paying for submission to those categories. To allow certain users (administrators) to submit a listing without payment, you can create a Coupon with 100% discount. The name of the coupon is the actual coupon code that the admins will need to use when ordering a plan. 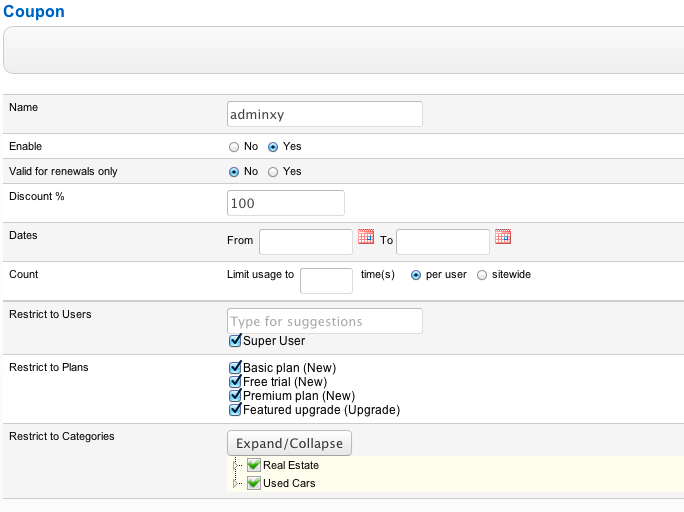 Discount is set to 100 and in Restrict to Users only the administrator (Super User) is selected. When submitting a listing, administrator will need to select a plan, and later enter the coupon code when confirming the order.